For a long time, I have been dreaming to change our furniture’s appearance in the bedroom, and I have been constantly searching for different ideas. I like the use of chalk paint, so I decided I could give it a try. This idea was evolving in my mind so I suddenly realized that I can create a very beautiful accent if I use florally decorated fabric for some pieces of furniture. Unfortunately, I did not think of photographing the furniture before I started working, so I will only have to show the model of the big cabinet and one under the mirror. I hope you can get an idea of how they looked. 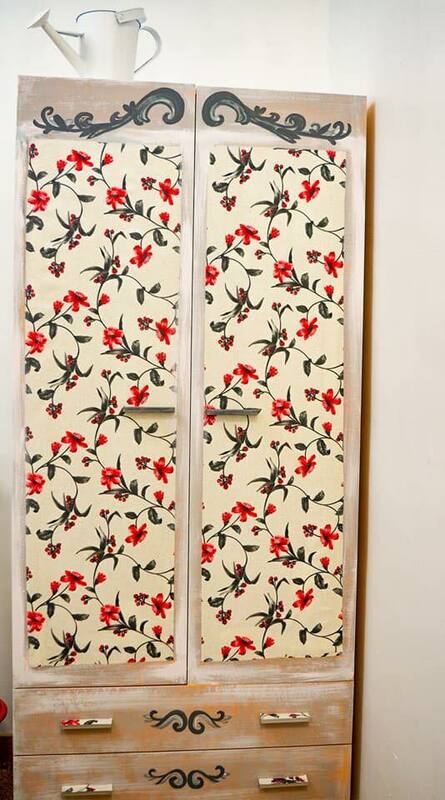 Although it looked fashionable, the cherry wood has long been in vogue, and I didn’t hesitate to paint it. I chose grey and beige chalk paint that gave a unique vintage look to the furniture. It is imperative to thoroughly clean all surfaces of dust and stains. A wet cloth can be used, and if you have a good furniture cleaner, you can use it. 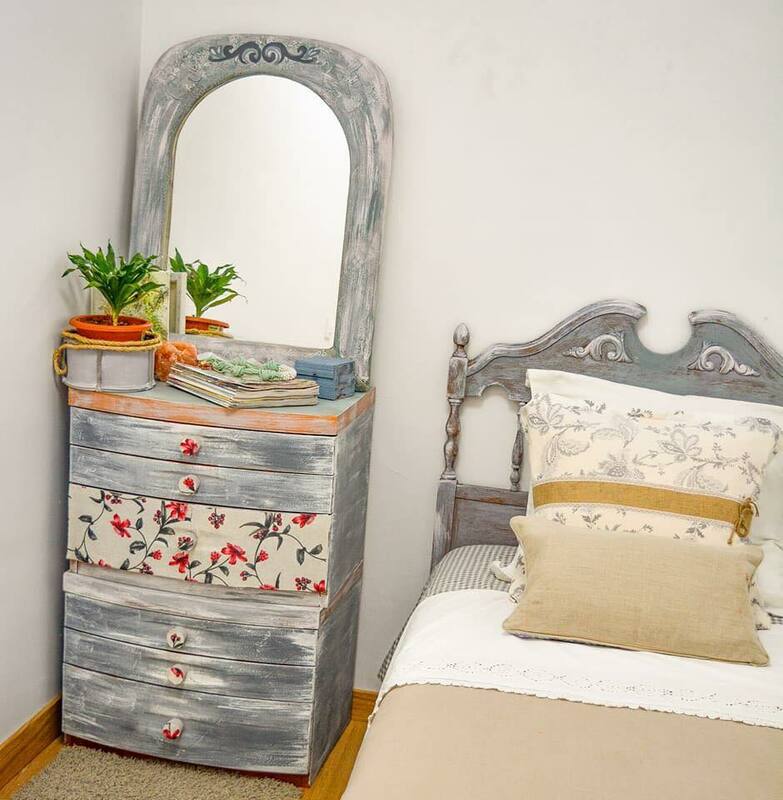 If it remains dirty somewhere, it will cause a lot of problems when applying the chalk paint or glue. It is good to remove the racks and drawer handles so that you can stick the fabric easier, then cut or drill only where it is needed. We should decide where we want to place textile and measure very carefully. Keep in mind that the fabric is usually elastic. 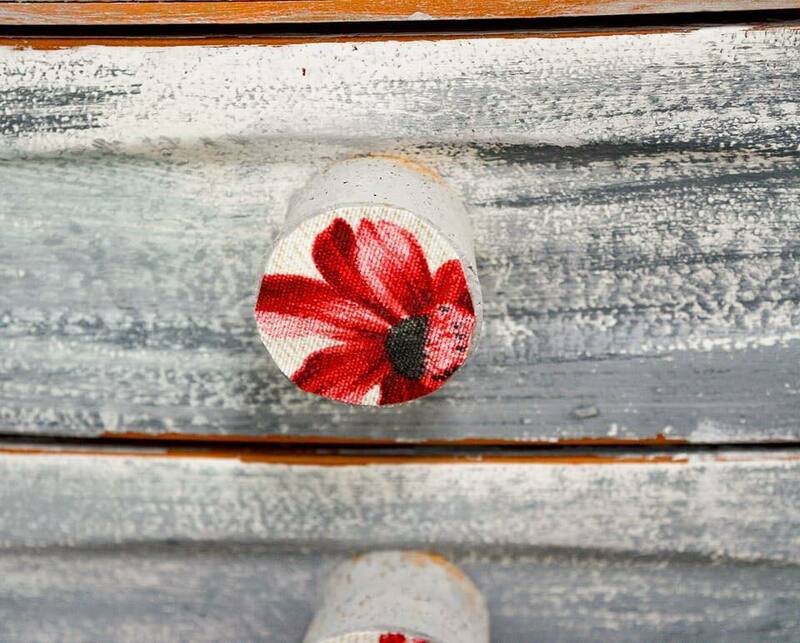 For the drawer handles, I cut circles with flowers to make them nicer and more colorful. Once the surface has been thoroughly cleaned, then start applying the chalk paint. I used the American décor. First, you should paint everywhere with the white paint and wait until it is dry. Then start applying the grey and the orange paint in a way you want it to be. So you basically apply two layers to cover well and hide the previous color and texture of the tree. When painting around a mirror, you can remove it from the frame, if it is possible or if it cannot, stick with paper so that you do not have to clean the paint afterward. 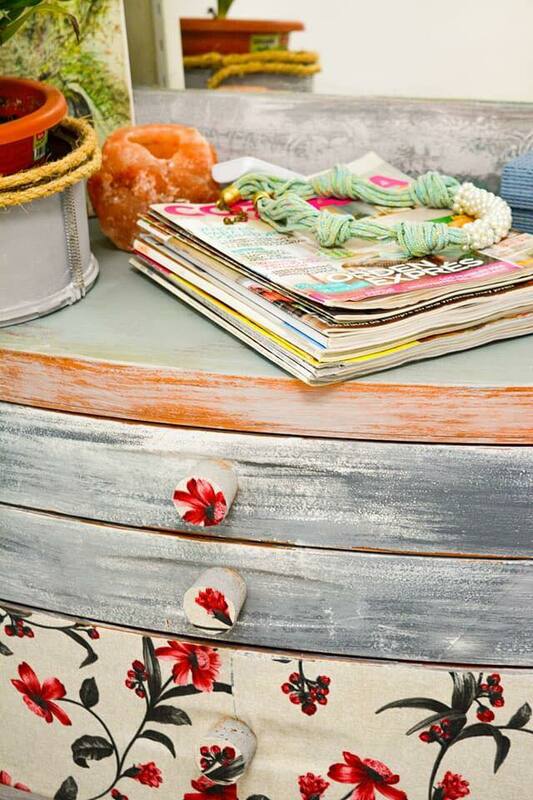 Once the chalk paint dries out, you can begin to apply glue to the fabric piece by piece. When you are bonding the fabric, the best way is to do it starting from top to bottom using a sponge to make it even and smooth. There shouldn’t be air left under the fabric material. The technique is similar to foil or wallpaper sticking. Once you are done, then wait for it to dry out. 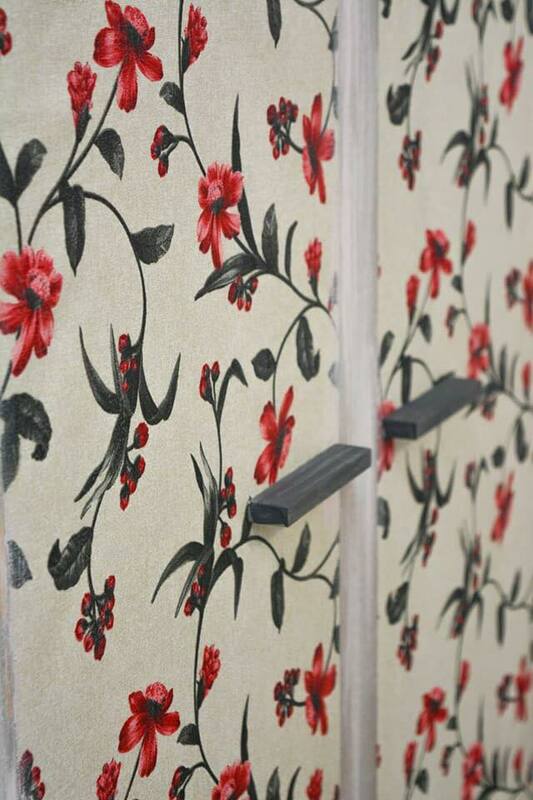 After we have completely painted the furniture and stuck the fabric, we need to seal with a transparent lacquer. Apply it evenly with a brush, making sure that it is not too much or that the brush is too dry to start pulling the cloth. I think it worked well, considering the fact that a lot of things were more of an experiment with colors and details. I have made the bedroom dashboard in the same way so all furniture can be in the same design. The color of the paint on the counter under the mirror is old gold and honey. 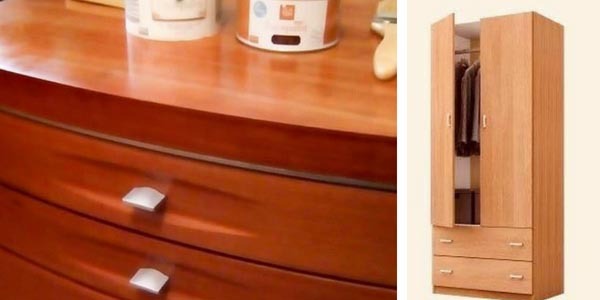 The small detail with a different color adds an emphasis to this piece of furniture. I chose this fabric as I love flowers and floral elements in general. It can also be used for children’s bedroom decor or nursery.